A look at the interactions of a gangster, his wife, a pair of hit-men, a boxer, a few perverts, and a pair of low-level criminals over the course of a few days in Los Angeles. 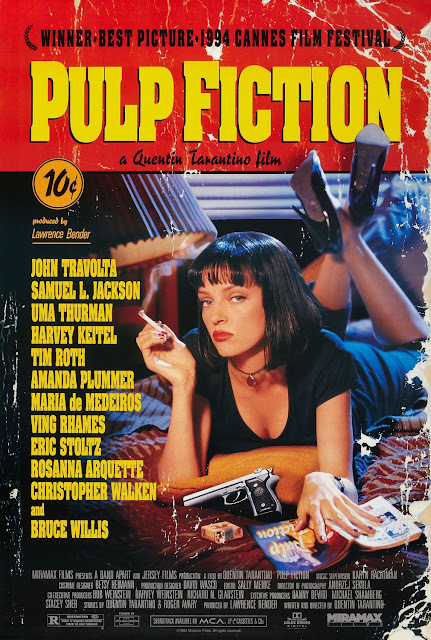 "Pulp Fiction" is the second feature film from writer/director Quentin Tarantino. It stars an ensemble cast including John Travolta, Samuel L. Jackson, Uma Thurman, Bruce Willis, Ving Rhames, Tim Roth, and Amanda Plummer, just to name a few. The film is made up of a series of interconnected shorts that tell a larger story and revolve around a pair of hit-men named Jules Vern and Vincent Vega, played by Jackson and Travolta. Even though every segment involves Vincent Vega in some way, he is not the primary focus of every section. Much like its predecessor "Reservoir Dogs," this movie is told in a non-linear fashion, jumping back and forth from one day to the next and then back again depending on which character the story focuses on for that moment. We are huge fans of Quentin Tarantino's work, and it doesn't get much better or more classic than "Pulp Fiction." This is a movie that oozes cool. From its aesthetic to the story to the dialogue, it is an amazing film. Samuel L. Jackson is absolutely brilliant as Jules, who gets two of the best exchanges in the whole film. He brings such a sense of gravitas to these scenes that it's hard to imagine anyone else delivering these now-classic lines with the same effectiveness. This performance earned him an Oscar nomination for best supporting actor, though he lost out to Martin Landau for his performance "Ed Wood" in what was a very stacked field that year. Speaking of Oscar nominations, "Pulp Fiction" received a bunch more, including recognition for both John Travolta and Uma Thruman, who both put on stellar performances in their respective parts. This is probably Travolta's career-best performance. The film was also nominated for its editing, directing, and the cream of the crop, best picture. Quentin Tarantino got to take home a gold statue for best screenplay along with co-writer Roger Avery in what we think is a very deserved win. We absolutely love "Pulp Fiction." We have seen it dozens of times and it never gets old. We love the way the story is told as it jumps back and forth along its timeline. It probably would have been just as effective if it were told in a normal fashion, but this way it ends on the perfect high note in such an iconic way. Add this excellent storytelling to tons of fantastic performances, a memorable soundtrack, and quippy, excellent dialogue, and you've got a recipe for success.